This new Copper Stringers Zone has been followed over a distance of 180 meters at surface by four (4) holes of the January 2019 drilling program and by previous drillhole MB17-03. 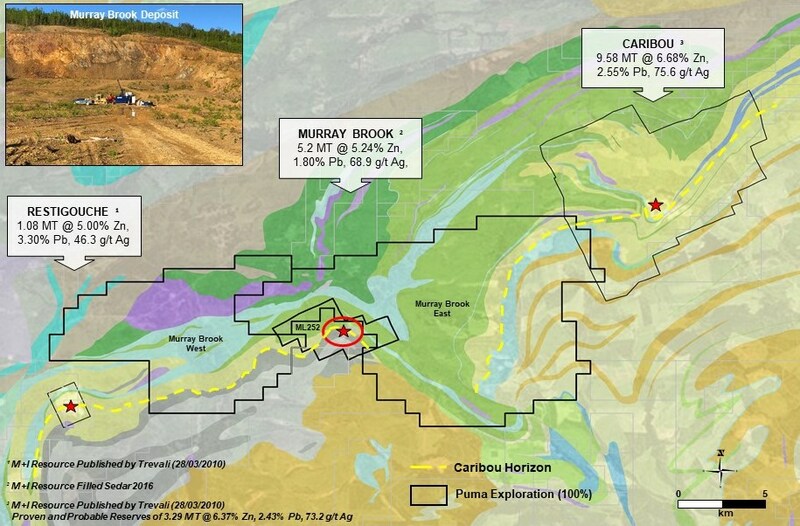 The Murray Brook Deposit (Mining Lease #252) covers an area of 484 hectares with a currently defined measured and indicated mineral resources of 5.28 million tonnes averaging 5.24% zinc, 1.80% lead, 0.46% copper, 68.9 g/t silver and 0.65 g/t gold. The core of this mineral resource occurs in the West Zone which is 200 meters wide, extending from surface to 300 meters vertical and the true thickness of the massive sulphide body varies from 75 meters to 100 meters. The East Zone (Copper-Gold) is 100 meters wide, also extending from surface to 300 vertical meters and is mainly mineralized with gold and copper. On February 20th 2017, a NI 43-101 report was accepted and filed on SEDAR.